Assume that during the second stage of the conversion process outlined in Section 8.2 fusion power is released; the next question is the same of fission power: What is the best strategy to exploit it? In Newtonian physics thrust is produced by accelerat ing a propellant; power is indispensable to accelerate it, but might be in forms not immediately useable, e.g., high-energy photons (gamma-rays). During stage two of energy conversion, fusion produces high kinetic energy products such as He++, H+, electrons and others, see Figure 8.8. One strategy is to exploit the kinetic energy of these particles directly, letting them be free to leave the reactor with all their kinetic energy acquired, and with most of their momenta somehow aligned in the same direction of the desired thrust. For instance, this collimation may be realized by guiding particles using a magnetic field, B. In the end, this strategy is just like that in any chemical rocket or in fission fragment nuclear reactors (see Section 7.15), only here the "propellant" would be the very fusion products. One may call this propulsion strategy "thermal fusion propulsion". In fact, the temperature of fusion products is so high (a few MeV per He nucleus) that their ideal exhaust velocity or Isp may be 106-107m/s. Thrust, F, will depend on the mass fused and ejected per unit time, i.e., on reactor power, see Figure 8.4. Figure 8.4 shows that to obtain a thrust F = 100 tons with Isp = 105 s requires a 1,000-GW reactor, with a fusing flow-rate of order 1 kg/s. 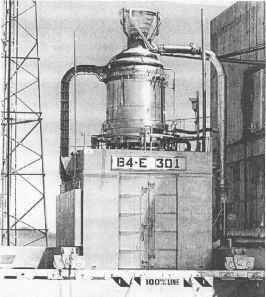 With a of order 3.5 x 10~3, see Figure 8.1, the actual mass injected into the reactor must be 1/a larger, or about 300 kg/s: it is easy to see that such thrust cannot be sustained for long periods of time, and probably not even a one-way stellar mission would be feasible within a 20-year time-span. However, quasi-interstellar missions appear at least possible, if not truly practical. As already seen in Chapter 7, the alternative strategy consists of using the fusion reactor as an electric generator, powering an electric thruster. This second strategy may be called "electric fusion propulsion''. Of course this choice involves thermaliz-ing fusion products inside a working fluid and using it in thermodynamic or direct-conversion cycles of some sort, just as in all ground fusion power plants concepts. Thermodynamic conversion is at most 50% efficient: the unused heat must be eliminated. In space this means space radiators, where the working fluid exchanges heat with the temperature of "space" (the 2.72 K of the cosmic background radiation discovered by Wilson and Penzias). The weight of the best space radiators is substantial, implying a major disadvantage of this strategy when power is large. At present most proposals being discussed to extract electric power from fusion do not go beyond standard thermodynamic cycles based on the heat extracted from the cooling jacket surrounding the reactor chamber. On the other hand, this strategy uncouples the propulsion system proper from the power generator, a better choice when thrust and Isp need to be modulated. For instance, when maneuvering near gravitational fields, larger thrust (at lower Isp) is better, while much smaller thrust, but with a much larger Isp, is better when en route to the final destination; electric thrusters lend themselves to such trade-offs in operating mode more easily than direct thermal fusion propulsion. In fact, contrary to chemical or fission rockets, where inert matter can be added to increase thrust at the expense of Isp, fusion reactors are far more intolerant of inert (that is, non-fusing) matter added. Inert matter can quench fusion kinetics immediately. At this stage of understanding of fusion it would be probably premature to assign a priority to the first or to the second strategy; picking one or the other will depend on factors at present beyond our knowledge, and especially on the type and scope of mission. Although these are the two main strategies, others are still conceptually possible, and will be mentioned when needed. The next question is how to achieve fusion in practice, namely the type of fusion reactor. Work in this area began in the 1950s, and is still continuing. Fundamental information is widely available [e.g., Kammash, 1995; STAIF], so the following sections emphasize basic physics rather than engineering still farther in the future. Because no experience exists so far in fusion propulsion, the authors will feel satisfied if at least the main pluses and minuses of reactor strategies proposed are made clear.